Being unemployed is one of the most critical phases of life. It not only cuts off the monetary resources but also affects emotionally that can have an impending hit on family and social life. It all boils down to how you would like to treat this phase. Positively, with exuberance of finding a job that you want or lay back and make a fuss about this juncture. With a plethora of online resources, the job opportunities have only multiplied in recent past. It all depends on how you wish to navigate and place the search apparatus at right places. Offline searches are no longer a fad. The job trade now parks itself in the heart of online marketplace. Here is our list of latest trends in the recruitment field in the cyber world. A hot bed where recruiters meet job seekers. Thousands of companies post their requirement and millions of job seekers register to meet potential employers. Generally, the services for hosting your profile on these portals is free for the job seeker. Some of the top sites in US are Monster, SimplyHired & CareerBuilder. Register on at least 2 of the top job websites with complete details of your profile as required to ensure completeness. Provide details of your skill sets and set job alerts. Search with “keywords” at regular intervals and make contacts. Update your resume regularly to stay on top and if need be, make use of additional services offered by job portals such as resume maker to enhance your profile. The most popular social networking site for professionals. This is where you can actually “hook up” , build network and exchange information. Organisations trust this site to fulfill their talent search requirements owing to transparency and exclusivity. Linkedin is a great medium to look up for jobs not only in your country but also opportunities abroad. Update your profile in full and change the visibility settings to “public” to get more views. Update your skills, get them endorsed and accept testimonials to enhance your profile. Join like minded groups, participate in discussions and forums & share experiences. Watchout for messages on wall from recruiters & respond accordingly if the profiles interests you. Use Pulse – the self publishing tool to write some creative stuff which adds great value. Do not be aggressive, assertiveness helps. And we thought social media was all about entertainment! Perhaps, this is one of the most direct channels to interact with companies and recruiters and even apply for jobs on customized pages by cutting out middlemen and processes. Simply “like” the pages and scout the relevant tab for latest openings and apply. Organisations are investing heavily on social recruitment platforms. Who knows? Your next offer may come from the social media. Also follow exclusive Twitter handles of companies and watch out for Tweets announcing job openings and exclusive drives. “Like” the pages and check for updates on a regular basis. Search for jobs matching your profile/educational background and apply immediately. “Comment” to share your feedback on various posts and campaigns to fall in the limelight. Share your experiences and participate in forums and online events. Follow Twitter a/c for job updates and follow thread to apply. Do not hesitate to retweet if it helps someone with relevant #tags. A fast growing network that started as a community for company reviews and is currently redefining the way job searches happen. Glassdoor offers honest and moderated reviews from employees who volunteer to provide feedback about the organization that they are employed with with a view to guide prospective job seekers. In line with changing times, this site now hosts an elaborate section for job seekers to meet employers and apply for jobs. Update your full profile and fill and sections as requested. Subscribe for email alerts. Read reviews about companies, understand the nature of business and employee satisfaction ratings. Make regular contacts with employers you choose to apply with, interact frequently. Finally, an offline option that is still worth the salt. The most effective medium to apply for for jobs and make contacts. 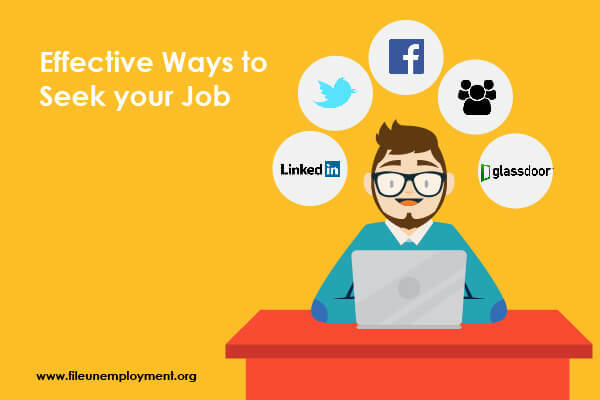 If you’re actively looking for jobs, refresh your contacts and check for suitable job openings in their organisations and ask them to refer you. Referrals are heavy duty sourcing machines for companies around the World. Who knows? Your friend might be your next colleague! What is a 1099 Form and How to File it? How Does Basic Income Disincentivize Work? Cumberland NJ Unemployment Center kept me on hold for 2 hours; I finally had someone answer my call, after providing my information and question regarding the status of my NJ Unemployment Claim the representative disconnected my call. Excellent list of things to help execute better. Even taking 3 or 4 of these that one does not currently utilize could help immensely. How did you calculate the total weekly Illinois benefit of $1495? Also, why isn’t Washington and Minnesota listed in your top 5 states with the highest paid unemployment insurance compensation? © 2019 File Unemployment. All Rights Reserved. FileUnemployment.org is a private website intended for the purpose of reference alone. The information available on site cannot be considered as advice of any form as it may be obsolete or incorrect.